SINGAPORE, 2017-Mar-29 — /EPR Retail News/ — DFS Group (DFS), the world’s leading luxury travel retailer, launched its sixth annual Masters of Wines and Spirits in Singapore on Saturday, March 25. The highly-anticipated Masters of Wines and Spirits program brings together an extraordinary collection of more than 60 Cognacs, wines and whiskies from over 50 legendary houses. 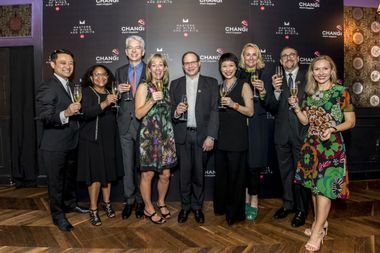 Unveiled at a spectacular gala event in partnership with the Changi Airport Group on Singapore’s historic Tras Street, the curated collection will be exhibited in store and available for sale at DFS, Singapore Changi Airport’s Wines and Spirits Duplexes at Terminal 2 and 3. Inspired by the world traveler’s desire for discovery, DFS’ team of experts scoured the globe, working hand-in-hand with leading producers of Champagne, Cognacs, whiskies and wines to curate an exceptional collection of extremely rare and one-of-a-kind pieces available only at DFS. At the heart of this year’s gala event was the city and spirit of Singapore – the birthplace of DFS’ Masters of Wines and Spirits. Celebrating the unique heritage of the Lion City, DFS hosted its gala along the historic Tras Street with VIP guests joining the world’s leading brands and their ambassadors for an evening of entertainment amongst iconic shophouses. DFS transformed individual shophouses into celebrations of signature wines and spirits where guests interacted with ambassadors from iconic brands, offering their insight, knowledge and exclusive tastings. This year’s event also featured hands-on master classes and educational tastings for select VIP guests. At The Dalmore house, Master Blender Richard Patterson hosted a bespoke tasting to showcase The Dalmore’s rich heritage and artistry. Frederic Dezauzier, Global Brand Ambassador of CAMUS introduced guests to the smallest and rarest cru in the Cognac region, Borderies, providing a unique tasting experience featuring a selection of CAMUS Borderies Single-Cru Cognacs, including a Borderies Vintage and an exclusive Borderies blend that has never been released. Château Margaux’s Regional Ambassador Thibault Pontallier conducted a vertical tasting across decades of the brand’s history. Guests were also given an opportunity to meet key whisky brand ambassadors brought together by DFS’ very own The Whiskey House – an exclusive and interactive whisky retail concept available to travelers at DFS, Singapore Changi Airport. Moderated by DFS Group’s Director of Spirits Frederik Vanden Bulcke, The Whiskey House provided guests with an interactive discussion and guided tasting with Brendan McCarron of Glenmorangie, Brian Kinsman of Glenfiddich, David Stewart of The Balvenie and Mike Miyamoto of Hibiki, all sharing their thoughts on heritage and innovation in the whisky industry. Following the Masters of Wines and Spirits gala event on March 25, the Masters of Wines and Spirits curated collection will be available for travelers and shoppers at DFS, Singapore Changi Airport’s Wines and Spirits Duplexes at Terminals 2 and 3. DFS Masters of Wines and Spirits is part of the DFS Masters Series, a signature program of exhibitions that also includes the highly-anticipated Masters of Time set to take place in Macau this December. The Masters Series is a showcase of the pinnacle of DFS’ leadership and innovation in curating and creating exceptional experiences across its five pillars of luxury: Wines and Spirits, Beauty and Fragrances, Watches and Jewelry, Fashion and Accessories, and Food and Gifts. This entry was posted in Management, Marketing, Retail, Retailer and tagged DFS Group, Masters of Wines and Spirits, Philippe Schaus. Bookmark the permalink.